"Introducing Permutation; our experimental series of pilot-batch, draft only beers showcasing the unique visions and innovative concepts developed by our production crew. 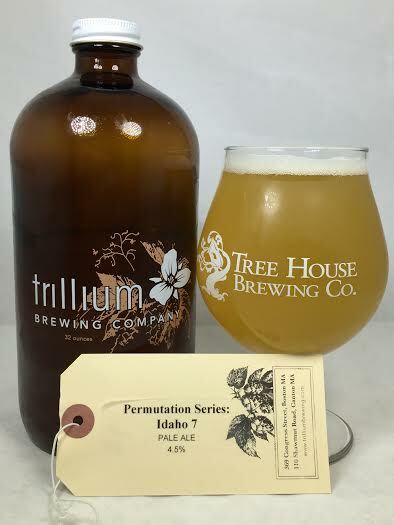 To kick things off we present the highly sessionable Idaho-7 Pale Ale; a light bodied easy drinker featuring a new aromatic hop variety cultivated in- you guessed it- Idaho. Clocking in at under 5% ABV, this brew is crafted for warm weather and lazy days. Hop-driven aromas of lemon, apricot, and white grapes take the lead with similar flavors following through on the palate. Slightly grainy, yet refreshingly dry with a hint of pithy citrus on the finish." The appearance has that typical hazy, murky New England look, but is pale yellow in color with less than a finger of bright, white head. Heavy doughy malt on the aroma with some wheat. The biggest fruit flavors I pick up are lemon and a very subtle grape juice. Lemon is definitely the biggest flavor at the front of the tongue and it brings a tart, refreshing quality to the beer. Just like the aroma, there's a hefty dry, doughy malt character with a lot of breadiness and wheat. I do detect a minuscule amount of white grape, but it's not brought to the table with the same intensity as it is with Nelson hops. The finish still has those doughy malt characters with none of the aforementioned fruity notes. Mouthfeel is nice and light. It is also significantly dry, but thanks to a light feel and lemon flavor, it is also refreshing at the same time. This one is truly sessionable at 4.5% and can be crushed on a hot day. I think this one is pretty straightforward. Idaho 7 is an easy-to-drink pale ale that is both dry and refreshing. There's enough lemon to make it drinkable without letting the dryness hold you back from drinking your entire growler without sharing. The low abv might fool you into thinking that the flavor is hard to find, but that's not the case here. It's only available on draft if you want to take it home, so make the trip and sip on it outside as the weather (finally) warms up around here.